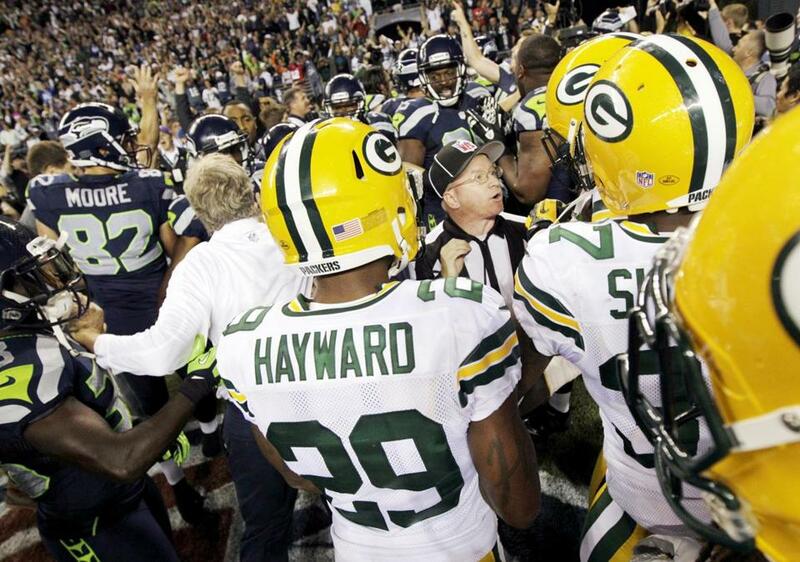 A replacement official tries to sort out the mess in the aftermath of the final play in Seattle’s controversial win over Green Bay Monday night. While the call was a joke by at least one definition, it was no laughing matter, something that was emphasized in the serious and smart postgame coverage of the debacle on ESPN and the NFL Network. The replacement officials, who have spent the first three weeks of the NFL season repeatedly reminding viewers that the locked-out regulars are actually quite competent, may have sent the labor dispute past its tipping point with the decision to award Seattle receiver Golden Tate a touchdown on the game’s final play. Never mind that the ball was securely wrapped up in the arms of Packers defensive back M.D. Jennings as Tate attempted to wrestle it away, or that Tate committed blatant offensive pass interference on the play, or that one official initially signaled touchdown while another indicated it was an interception. The Seahawks “won” the game. And the NFL lost face in a game so poorly officiated that the Patriots-Ravens disaster from the previous evening was all but forgotten. If there is a blessing in the mess — beyond the hope that the backlash might facilitate a settlement to the labor dispute — it’s that the rights-holding television networks have not let their multibillion-dollar business partnerships with the NFL temper their broadcasters’ commentary. Such honesty isn’t surprising from Collinsworth, an outstanding broadcaster who habitually tells it like it is. But it is particularly refreshing — and perhaps a little surprising — when criticism comes from ESPN. The network, which signed a $15.2 billion rights extension through 2021 with the NFL for “Monday Night Football’’ last year, has been accused in the past of placating the wishes of the NFL, most notably in 2004 when it cancelled the controversial drama “Playmakers’’ at the league’s behest. “ESPN has business relationships with leagues, conferences, and others that are very important to us,’’ said John Wildhack, ESPN executive vice president/production. “We also have a mission to serve sports fans and a commitment to covering the news about those leagues each day on ‘SportsCenter,’ our studio shows, and within our coverage of events. ESPN did take it very seriously Monday night, not only during the broadcast but in the postgame programming as well, providing candor and clarity amid the chaos. Engaging, insightful, funny, and charismatic, Jon Gruden is everything ESPN covets in an analyst, but his reluctance to criticize, perhaps born out of a desire to return to coaching someday, sometimes rankles viewers. On Monday, he sounded almost distraught as the officiating blunders mounted. The other call Gruden referenced was a pass-interference call against the Packers’ Sam Shields on which Seahawks receiver Sidney Rice appeared to interfere with him. “That’s not defensive pass interference,” Gruden said as the replay revealed in slow motion just how wrong the call was. “I have studied it a long time as well. His play-by-play partner, Mike Tirico, was more succinct. Hall of Fame quarterback Steve Young was particularly compelling, emotionally articulating his frustration in a manner that almost sounded like a plea. Several names and topics related to the game trended on the social media outlet, and a who’s-who of athletes and celebrities chimed in. Tweeted LeBron James, “I simply just LOVE the NFL to much to see these mistakes. I’m sick like I just played for the Packers.” Former Cowboys quarterback and current Fox analyst Troy Aikman didn’t hedge: “These games are a joke.’’ Like Patriots linebacker Brandon Spikes after the loss to the Ravens, a couple of Packers took to Twitter to express their frustrations, most notably guard T.J. Lang. “Got [expletive] by the refs. Embarrassing. Thanks nfl,” he wrote. Overnight, the controversy grew to such magnitude that it ceased being a sports story and expanded to that hazy realm between news and pop culture. Matt Lauer interviewed ubiquitous NFL reporter Peter King on the “Today Show,” while Kathie Lee Gifford and Hoda Kotb chimed in later during “The Scoop” segment on the same program before getting to the earth-shattering news of Carrie Underwood complying with a 12-year-old boy who requested a kiss at her concert. Allegiances aside — Democrat, Republican, ESPN, NFL Network — that’s something everyone agrees on. Except maybe in Seattle.